This photo was taken on February 28, 2018 at 2:51 PM. The location was in front of the entrance of a hotel in Largo, Maryland. The "Take It!" came from the realization that every year our feathered friends leave to go south for the winter and while they are gone, their home is ravaged by what ever storms the winter may bring. 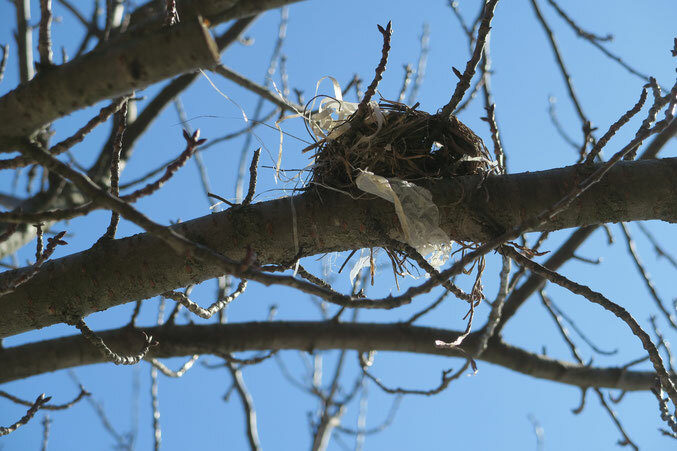 The result of all of this weather beating, finds the birds having to rebuild their nest on an annual basis. I sometimes wonder if when they return and get first sight of their challenge, that they have some sort of conversation in bird talk on the mess, and quickly enough get right into the business of making repairs to bring it back into livable shape for the busy season. The After Take: All that I showed this photo to, were just like me, in never having thought of using the "Fixer Upper” label for this application. I think we all agreed we will laughingly refer to it this way when we encounter yet another one, in waiting for its annual remodeling job to be done. Needless to say, it is creativity at its finest. Here is hoping there is a sample of a nest ready for this process, on a low branch near you, and perhaps you can get a "before & after" set of photos, along with some arrival of new offspring. Wishing you my best as we move toward Spring. Birds are the ultimate hoarders lol. It’d be interesting to find out if it’s one of those species that return year after year. Our daughter really wants to know what kind of bird lives there and “I don’t know” doesn’t seem to satisfy her. Don’t you guys get those eagles every year? The presidential birds.